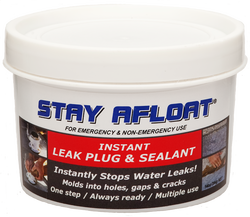 "STAY AFLOAT", INSTANT LEAK PLUG AND SEALANT, IS A SIMPLE AND VERSATILE MATERIAL INTENDED TO BE USED IN THE APPLICATION OF STOPPING OR SLOWING WATER LEAKS. USED ALONE IT REQUIRES NO MIXING, MEASURING OR CURING. IT IS EASILY MOLDED AND APPLIED BY HAND; INTO HOLES GAPS AND CRACKS. APPLIED IN SUFFICIENT QUANTITY IT CAN STOP OR SLOW MANY TYPES OF LEAKS. AND, COMBINED WITH OTHER MATERIAL(S), SUCH AS WOOD OR PLASTICS, IT CAN STOP OR SLOW LARGER SIZE LEAKS. IT HAS ADDITIONAL APPLICATIONS SUCH AS SEALING, LUBRICATING AND WATER PROOFING. TO LEARN MORE ABOUT THE PRODUCT PLEASE READ THE FAQ/ADDITIONAL USE PAGE. IT IS NOT INTENDED TO REPLACE OTHER SAFETY OR DAMAGE CONTROL ITEMS. STAY AFLOAT HAS BEEN USED IN MANY RESCUE OPERATIONS, YET IT TAKES COMMON SENSE TO KNOW WHERE, WHEN AND HOW IT CAN BE USED. (IT IS NOT A MIRACLE PRODUCT OR GIMIC). IN MOST CASES, STAY AFLOAT IS A TEMPORARY FIX AND LEAKS SHOULD BE PERMANENTLY REPAIRED AS SOON AS POSSIBLE. IF YOU HAVE ANY QUESTION'S PLEASE FEEL FREE TO CONTACT ME DIRECTLY. FOR AN ACTUAL CASE REFERENCE PLEASE SEE, "THE KIT THAT SAVED A BOAT", ON OUR MKTG. PG. USCG 1600 TON MASTER MARINER (OCEANS), MASTER OF TOWING, (OCEANS), N.Z. OFFSHORE MASTER, UNLIMITED.